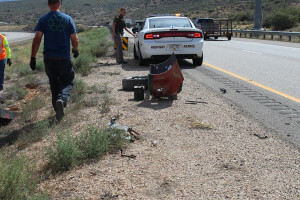 TOQUERVILLE — A fortunate woman was mostly unharmed after a rollover on Interstate 15 near Toquerville Thursday afternoon that totaled her car. 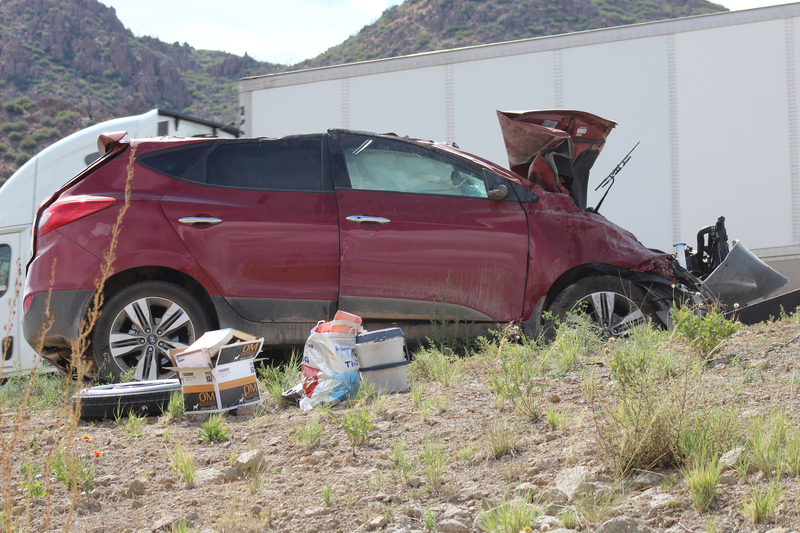 A 46-year-old Nevada woman was driving a red Hyundai southbound on I-15 at about 3 p.m., just past mile marker 30 near the Toquerville exit, when she attempted to make a lane change. She hadn’t seen a car that was in the lane she was trying to move into, Utah Highway Patrol Trooper Seth Spencer said, and she swerved away at the last second. The woman lost control of the vehicle, and it rolled twice before landing wheels-down in the left lane. The car did not have any other human passengers, but there were two dogs in the vehicle with her. The woman had some minor injuries but refused ambulance transport, Spencer said. The dogs were unharmed. The Hyundai, however, was totaled and had to be towed from the scene. Pieces of the car, including a tire, the front bumper and the battery, had come loose and had to be collected from the side of the road. There were no other vehicles involved in the collision, although the car took out two guard posts from the side of the freeway. While the right lane remained completely open, the left lane around the area immediately surrounding the collision was closed down for about an hour until responders could move the car. In addition to UHP, Utah Department of Transportation incident management and a member of the Washington County Sheriff’s Office were also on scene.